Poland has suspended one of its honorary consuls in the US because of a digitally altered picture of European Council President Donald Tusk dressed in a SS uniform that appeared on her Facebook page. The consul claims her account was hacked. Maria Szonert Binienda, who has been serving as Poland’s honorary consul in Akron, Ohio, has been suspended from duty by Poland’s Foreign Ministry, Polish media reported on Sunday. Her sacking comes after a picture appeared on her Facebook account in which Donald Tusk, who is also a former Polish Prime Minister, is depicted as a Nazi officer. While the post on her page is no longer available, some people apparently managed to take screenshots. The ministry is to make further decisions on the fate of the official after the country’s foreign minister, Witold Waszczykowski, returns from a three-day visit to Australia. Maria Szonert Binienda said she had nothing to do with the image, claiming her account was hacked. “I did not make a photo of Donald Tusk as an SS-man. I am against promoting SS symbols and ideologies. I am against using words like ‘fascism’ in public political discourse today. I am against comparing our politicians to Hitler,” Szonert Binienda said in statement quoted by AP. The lawyer also wants to initiate judicial proceedings over the picture. — Roman Giertych (@GiertychRoman) 29 апреля 2017 г.
Szonert Binienda stated that the Foreign Ministry’s decision “was taken because the matter is very complicated and serious” and “requires a thorough explanation,” according to Polish Press Agency. Meanwhile, it looks like the official has already regained access to Facebook, as she wrote in a post on Friday that she was going to suspend her account. Another post says she will suspend all current political and journalistic activities on social media if she is reinstated as honorary consul in Ohio. The suspended official blames the media for launching a “massive campaign of lies and slanders” against her because of her role in an inquiry into a plane crash near the Russian city of Smolensk in 2010, in which the president of Poland perished. She claimed that the new allegations are aimed at “paralyzing” the investigation. 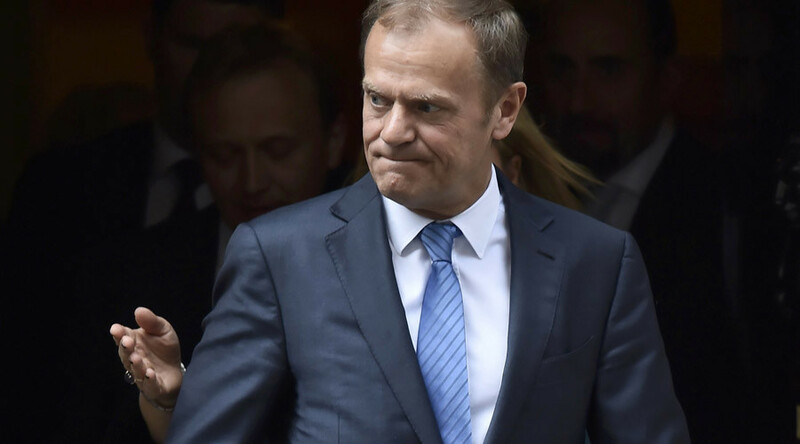 Earlier, Polish Defense Minister Antoni Macierewicz accused Donald Tusk of negligence and “criminal offense” over the probe into the 2010 plane crash, while calling for him to be investigated.